Let's say you're playing a live-act and all your knobs on the Amp are all the way up and you are on the maximum setting in Operator or Wavetable. 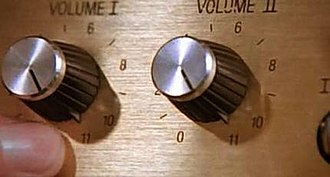 So what we should be able to do if we need that extra push over the cliff is to turn it up to eleven. Just take the dry-wet-knob as an example. Right now that one even goes up to one hundred. JuSchu wrote: Let's say you're playing a live-act and all your knobs on the Amp are all the way up and you are on the maximum setting in Operator or Wavetable. Couldn't you just stack multiple Amp plugins. A sensible request. I think this can be solved with Max for Live. Simply: create a device with this graphic and map it to the output of the Amp device. this does nothing and makes you feel as though you got what you wanted. if you cannot find the option, it's because Ableton hate you and removed it from your license.